Carrie's working on another incredible shawl. (Remember her first one?) This one is a beautiful blue/green and is about half way done. There are much better pictures of it at her blog, here. 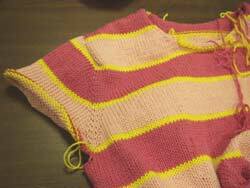 Carrie's finished her top-down stripey sweater. Love those colors and the darts give it such a great shape. The perfect spring sweater! 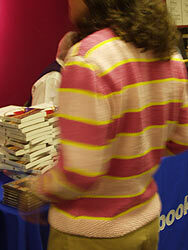 This week Carrie brought in a beautiful cotton striped sweater she's knitting using Barbara Walker's techniques for knitting set-in-sleeves from the top. This is, like, the coolest thing I've ever seen! 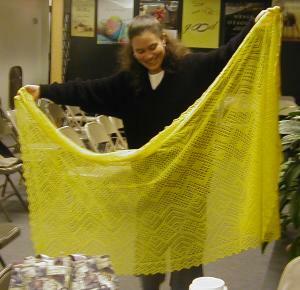 More beautiful lace (in yellow!) from Carrie. 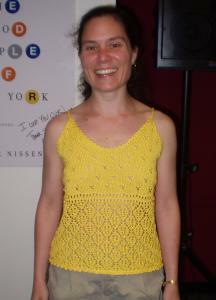 This is a lovely camisole from the latest Interweave Knits. 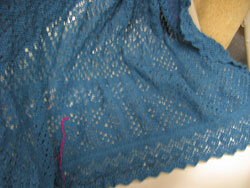 Carrie has been working on this incredible shawl since last January. And now it's done. Whatever will she work on next? It's a hard act to follow!